Vacancies. 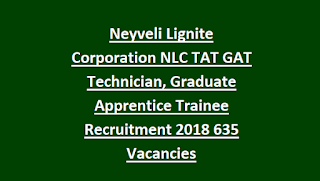 There are 300 GAT and 335 TAT slots in this NLC Recruitment 2018 Notification. Candidates who are qualified Diploma after 01-04-2016 they are eligible to apply for these NLC TAT vacancies and for GAT vacancies Engineering qualification required. Candidates selection for this NLC TAT/GAT vacancies will be held through Merit in qualifying examination only. 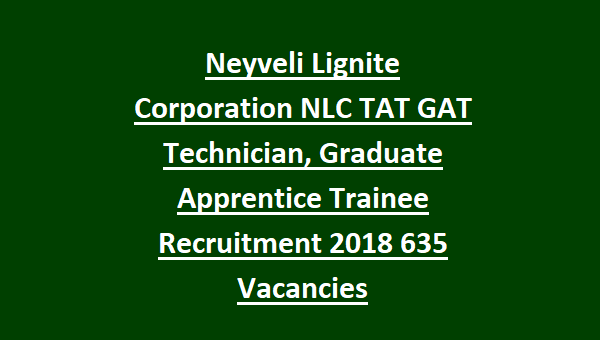 Online registration for this NLC India Ltd vacancies of Technician/Graduate Apprentices Trainee is available from 16-10-2018 to 25-10-2018 though official website of www.nlcindia.com. More information such as short list available date, joining date, application procedure, vacancies and other details are given below. There is no specific age limits are given but candidates who are qualified Engineering or Diploma on or after 01-April-2016 they are only eligible for applying this NLC India vacancies. Candidates must have qualified Engineering in respective discipline for Graduate Apprenticeship Training. For Technician Apprenticeship Training candidate must have completed diploma. Selection for this NLC apprentices will be based on their qualifying marks percentage in academic. Candidates will be shortlisted in 1:3 ratio and those candidates only called for certificates verification. Candidates have to apply online from 16-10-2018 to 25-10-2018. And online submitted/filled application copy along with necessary documents duly signed should reach NLC India office on or before 30-10-2018. Apply Online here for NLC Recruitment GAT/TAT.